Claudia A. Steiner, M.D., M.P.H., Audrey J. Weiss, Ph.D., Marguerite L. Barrett, M.S., Kathryn R. Fingar, Ph.D., M.P.H., and P. Hannah Davis, M.S. Mastectomy (surgical removal of the breast) is a common procedure used in the treatment of breast cancer. Although 97-99 percent of breast cancers occur in only one breast,1 some women choose also to remove the healthy breast—a contralateral prophylactic mastectomy (CPM). Reasons that women elect to undergo CPM include physician advice, fear of a subsequent breast cancer diagnosis, desire for cosmetic symmetry, family history of breast cancer, and genetic susceptibility to breast cancer due to mutations in the BRCA1 and BRCA2 genes.2,3 Some women, such as those with a genetic predisposition to breast cancer, may choose to have prophylactic bilateral mastectomy without occurrence of cancer in either breast. This Healthcare Cost and Utilization Project (HCUP) Statistical Brief presents data on bilateral and unilateral mastectomies among adult women in two hospital settings: hospital inpatient and hospital-based ambulatory surgery. The analysis is limited to hospitals within 13 States—representing more than one-fourth of the U.S. population—for which bilateral versus unilateral mastectomies could be identified in both the inpatient and ambulatory surgery settings. Bilateral mastectomies with a cancer diagnosis are likely unilateral mastectomies for cancer with a CPM. Bilateral mastectomies without a cancer diagnosis are likely prophylactic bilateral mastectomies. Unilateral mastectomies without a cancer diagnosis are likely CPMs following a prior unilateral mastectomy with cancer in the other breast. In this Statistical Brief we provide an overview of characteristics of mastectomies by hospital setting (inpatient and ambulatory surgery) in 2013. We present trends in the overall rates of bilateral and unilateral mastectomies and by hospital setting from 2005 through 2013. The cumulative percentage change over the 9-year time period in the rate of mastectomies based on hospital setting and presence of breast cancer also is provided. Finally, the proportion of all hospital-based mastectomies by type of mastectomy and presence of breast cancer is presented. All differences noted in the text differ by at least 10 percent. Table 1 presents characteristics of bilateral and unilateral mastectomies performed in the hospital inpatient setting compared with the hospital-based ambulatory surgery setting in 2013. Between 2005 and 2013, the rate of hospital-based bilateral overall rate of mastectomy increased 21 percent, from 74 to 90 per 100,000 adult woment. The rate of hospital-based bilateral mastectomies (inpatient and outpatient combined) tripled, from 10.0 to 29.7 per 100,000 adult women, whereas the rate of unilateral mastectomies remained relatively stable at around 64 per 100,000 women. Women who had a bilateral mastectomy in 2013 were about 10 years younger than those who had a unilateral mastectomy. From 2005 to 2013, the rate of bilateral outpatient mastectomies increased more than fivefold and the inpatient rate more than doubled. The rate of unilateral mastectomies nearly doubled in the outpatient setting but decreased 36 percent in the inpatient setting. By 2013, nearly half of all matectomies were performed outpatient. Regardless of hospital setting, between 2005 and 2013, bilateral mastectomies with cancer more than tripled and bilateral mastectomies without cancer more than doubled. The rate of unilateral mastectomies without cancer also increased (by 23 percent), but the rate of unilateral mastectomies with cancer remained stable. The proportion of hospital-based mastectomies shifted away from unilateral mastectomies with breast cancer and toward bilateral mastectomies, with and without breast cancer. By 2013, more than one in four hospital-based mastectomies were bilateral with cancer. a Other race/ethnicity includes Asian/Pacific Islander and American Indian/Alaska Native. b Two of the 13 States included in this analysis did not report race/ethnicity information. Two-thirds of mastectomies performed across 13 States were unilateral; the remaining one-third were bilateral. Of 30,101 mastectomies performed across 13 States in 2013, two-thirds were unilateral (20,195 mastectomies) and one-third were bilateral (9,906 mastectomies). About one-third of bilateral mastectomies were performed in the outpatient setting, and half of unilateral mastectomies were done outpatient. Of the 9,906 bilateral mastectomies, one-third were outpatient and two-thirds were inpatient. Of the 20,195 unilateral mastectomies, approximately half were performed outpatient and half were inpatient. By 2013, 45 percent of all mastectomies were performed in the hospital-based ambulatory surgery setting. On average, women who had a bilateral mastectomy were approximately 10 years younger than those who had a unilateral mastectomy. In 2013, the average age among women who had an inpatient bilateral mastectomy was 51.3 years compared with 60.4 years for unilateral mastectomy. Similarly, the average age for an outpatient bilateral mastectomy was 51.8 years compared with 62.0 years for unilateral mastectomy. Nearly two-thirds of bilateral mastectomies across settings were among women under aged 55 years compared with about one-third of unilateral mastectomies. Black women were a larger proportion of unilateral and inpatient mastectomies than bilateral and outpatient mastectomies. Black women were twice the proportion of unilateral as bilateral mastectomies, in both the inpatient setting (16.1 vs. 8.6 percent) and outpatient setting (11.5 vs. 5.3 percent). For both types of mastectomies, Black, Hispanic, and other (non-White) women were a higher proportion of inpatient than outpatient surgeries. In contrast, White women were a smaller proportion of inpatient versus outpatient surgeries (bilateral: 69.8 vs. 76.0 percent; unilateral: 61.8 vs. 70.2 percent). Nearly three-fourths of women who had a bilateral mastectomy had private insurance as the expected primary payer compared with fewer than half of women who had a unilateral mastectomy. Over 70 percent of women who had a bilateral mastectomy had an expected primary payer of private insurance in both the inpatient setting (73.7 percent) and outpatient setting (70.5 percent). The share of women who had a unilateral mastectomy was approximately evenly divided between private insurance and Medicare (inpatient: 47.0 percent private insurance and 37.9 percent Medicare; outpatient: 42.8 percent private insurance and 44.5 percent Medicare). Women with Medicare were a higher proportion of outpatient than inpatient surgeries for both types of mastectomy (bilateral: 19.0 vs. 14.7 percent; unilateral: 44.5 vs. 37.9 percent). Nearly half of inpatient bilateral mastectomies were among women from the highest income communities. Approximately half of all inpatient bilateral mastectomies (48.2 percent) and more than one-third of inpatient unilateral mastectomies (36.8 percent) occurred among women from the highest income communities. Women from the lowest income communities were a larger proportion of outpatient than inpatient mastectomies (bilateral: 17.4 vs. 11.1 percent for Quartile 1 and 24.5 vs. 15.5 percent for Quartile 2; unilateral: 24.6 vs. 18.8 percent for Quartile 1 and 27.4 vs. 20.2 percent for Quartile 2). Compared with outpatient bilateral and unilateral mastectomies, average hospital charges were 34 percent higher for inpatient bilateral mastectomies and 52 percent higher for inpatient unilateral mastectomies. Average hospital charges were approximately $15,000 more for mastectomies performed inpatient compared with outpatient (bilateral: $59,900 vs. $44,600; unilateral: $40,400 vs. $26,500). Average length of stay also was higher for inpatient mastectomies (2.2-2.3 days) compared with outpatient mastectomies (0.8-0.9 days). Average hospital charges were approximately $18,000-$20,000 higher overall for bilateral versus unilateral mastectomies, but length of stay was similar for the two types of mastectomies. 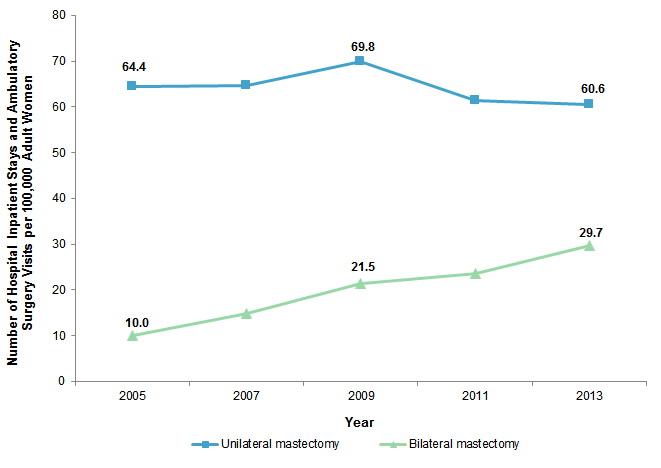 Figure 1 presents trends in the rate of hospitalization for bilateral and unilateral mastectomies from 2005 through 2013. Hospital inpatient surgeries and hospital-based ambulatory surgeries are combined. Figure 1. Rate of bilateral and unilateral mastectomies in hospital inpatient and hospital-based ambulatory surgery settings combined, in 13 States, 2005-2013. Figure 1 is a line graph that shows the number of inpatient stays and ambulatory surgery visits combined per 100,000 adult women for unilateral and bilateral mastectomies in 13 States from 2005 through 2013. The rate of unilateral mastectomies in hospital inpatient and ambulatory surgery settings combined remained relatively constant at 64.4 per 100,000 adult women in 2005 and 69.8 per 100,000 adult women in 2009, and then decreased to 60.6 in 2013. The rate of bilateral mastectomies in hospital inpatient and ambulatory surgery settings rose steadily from 10.0 in 2005 to 29.7 in 2013. The rate of bilateral mastectomies tripled between 2005 and 2013, whereas the rate of unilateral mastectomies remained relatively constant and then decreased during this period. Mastectomy rates varied somewhat over the 9-year time period from 2005 to 2013. While the bilateral mastectomy rate tripled from 2005 to 2013, the rate more than doubled between 2005 and 2009, from 10.0 to 21.5 per 100,000 adult women. After 2009, the rate of bilateral mastectomies continued to increase to 29.7 per 100,000 adult women in 2013. On the other hand, the rate of unilateral mastectomies remained relatively constant at 64.4 per 100,000 adult women in 2005 and 69.8 per 100,000 adult women in 2009, and then decreased to 60.6 per 100,000 adult women in 2013. The overall rate of mastectomy increased by 21 percent btween 2005 and 2013. Between 2005 and 2013, the overall, combined rate of unilateral and bilateral mastectomy increased from 74 per 100,000 women to 90 per 100,000 women, a 21 percent increase. 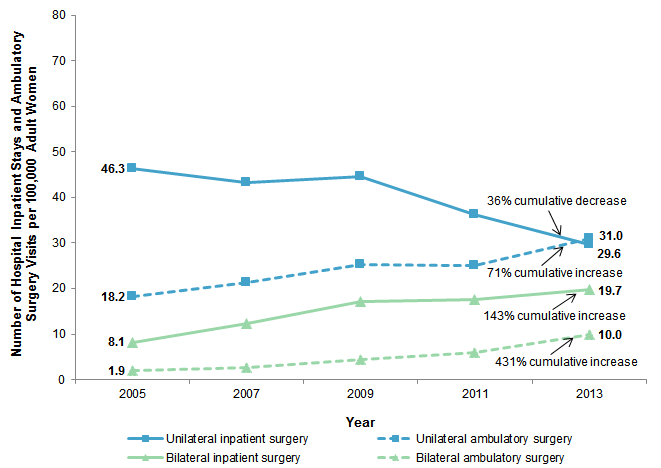 Figure 2 presents trends in the rate of bilateral and unilateral mastectomies that were performed in the hospital inpatient and hospital-based ambulatory surgery settings from 2005 through 2013. Note: Cumulative percentage change was calculated from rates that were not rounded. Figure 2. Rate of bilateral and unilateral mastectomies by hospital setting, in 13 States, 2005-2013. Figure 2 is a line graph that shows the number of hospital inpatient stays and ambulatory surgery visits separately for unilateral and bilateral mastectomies per 100,000 adult women in 13 States from 2005 through 2013. The rate of unilateral mastectomies in the inpatient surgery setting remained relatively constant at 46.3 in 2005 and 44.5 in 2009, and then decreased to 29.6 in 2013, for a 36% cumulative decrease. The rate of unilateral mastectomies in the ambulatory surgery setting increased from 18.2 in 2005 to 25.3 in 2009, decreased to 25.1 in 2011, and increased to 31.0 in 2013, for a 71% cumulative increase. The rate of bilateral mastectomies in the inpatient surgery setting increased from 8.1 in 2005 to 19.7 in 2013, for a 143% cumulative increase. The rate of bilateral mastectomies in the ambulatory surgery setting increased from 1.9 in 2005 to 10.0 in 2013, for a 431% cumulative increase. The rate of bilateral mastectomies increased between 2005 and 2013 in both the inpatient and outpatient settings. Between 2005 and 2013, the rate of bilateral mastectomies performed in the ambulatory surgery setting increased over fivefold, from 1.9 to 10.0 per 100,000 adult women. The rate of inpatient bilateral mastectomies more than doubled, from 8.1 to 19.7 per 100,000 adult women. In 2013, unilateral mastectomies were as common in the outpatient as in the inpatient setting. The rate of unilateral mastectomies in the ambulatory surgery setting nearly doubled between 2005 and 2013, from 18.2 to 31.0 per 100,000 adult women. However, the rate of inpatient unilateral mastectomies decreased 36 percent, from 46.3 to 29.6 per 100,000 adult women. By 2013, unilateral mastectomies were as common in the outpatient as in the inpatient setting. Table 2 presents the rate of hospitalization for bilateral and unilateral mastectomies by hospital setting (inpatient vs. ambulatory surgery) and presence of breast cancer in 2005 and 2013, along with the cumulative percentage change over the 9-year time period. The rate of bilateral mastectomies increased substantially between 2005 and 2013, regardless of presence or severity of breast cancer diagnosis or hospital-based surgical setting. Between 2005 and 2013, the rate of bilateral mastectomies that included a breast cancer diagnosis more than tripled, from 7.8 to 25.3 per 100,000 adult women. This increase was observed for bilateral mastectomies with breast cancer in situ—a less severe form of the disease—which nearly tripled, as well as for bilateral mastectomies with other breast cancer diagnoses, which more than tripled. The largest increase in the bilateral mastectomy rate occurred for those surgeries that involved a cancer diagnosis (not in situ) and were performed in the ambulatory surgery setting—a nearly 10-fold increase, from 0.7 to 6.8 per 100,000 adult women. The rate of bilateral mastectomies without any diagnosis of breast cancer more than doubled over the 9-year time period, from 2.1 to 4.4 per 100,000 adult women. The rate of bilateral mastectomies without breast cancer more than doubled in the inpatient setting and increased 64.4 percent in the outpatient setting. The rate of unilateral mastectomies with breast cancer remained stable overall between 2005 and 2013, but the rate of unilateral mastectomies without breast cancer increased. Between 2005 and 2013, the rate of unilateral mastectomies that included a breast cancer diagnosis remained relatively stable at 61.4 per 100,000 adult women in 2005 and at 56.9 per 100,000 adult women in 2013. The rate of unilateral mastectomies with breast cancer decreased 37.2 percent in the inpatient setting but increased 70.8 percent in the outpatient setting. The rate of unilateral mastectomies without any diagnosis of breast cancer increased 22.7 percent overall, with most of the increase in rate occurring among those surgeries performed in the ambulatory surgery setting—which nearly doubled, from 1.2 to 2.1 per 100,000 adult women. Figure 3 presents the proportion of all hospital-based mastectomies (inpatient and ambulatory surgery) as a function of type of mastectomy (bilateral vs. unilateral) and presence of breast cancer from 2005 through 2013. Figure 3. Proportion of hospital-based mastectomies (inpatient and ambulatory surgery) by type of mastectomy and presence of breast cancer, in 13 States, 2005-2013. Figure 3 is a bar chart that shows the percentage of hospital-based unilateral and bilateral mastectomies, with cancer and with no cancer present, in 13 States from 2005 through 2013. In 2005, 4.0% of hospital-based mastectomies were unilateral, no cancer; 82.6% were unilateral, cancer; 2.9% were bilateral, no cancer; and 10.5% were bilateral, cancer. In 2007, 4.1% of hospital-based mastectomies were unilateral, no cancer; 77.1% were unilateral, cancer; 3.0% were bilateral, no cancer; and 15.8% were bilateral, cancer. In 2009, 3.8% of hospital-based mastectomies were unilateral, no cancer; 72.7% were unilateral, cancer; 3.7% were bilateral, no cancer; and 19.8% were bilateral, cancer. In 2011, 3.9% of hospital-based mastectomies were unilateral, no cancer; 68.4% were unilateral, cancer; 4.1% were bilateral, no cancer; and 23.6% were bilateral, cancer. In 2013, 4.1% of hospital-based mastectomies were unilateral, no cancer; 63.0% were unilateral, cancer; 4.9% were bilateral, no cancer; and 28.0% were bilateral, cancer. Between 2005 and 2013, bilateral mastectomies, with and without breast cancer, increased as a proportion of all hospital-based mastectomies. Bilateral mastectomies with cancer increased from 10.5 percent of all hospital-based mastectomies in 2005 to 28.0 percent in 2013—more than one in four mastectomies. Similarly, the proportion of bilateral mastectomies without cancer increased from 2.9 to 4.9 percent of all mastectomies. During this same 9-year time period, the proportion of unilateral mastectomies with cancer decreased from 82.6 to 63.0 percent of all mastectomies, and the proportion of unilateral mastectomies without cancer remained constant at about 4.0 percent. The volumes and rates in this Statistical Brief are based upon data from the Healthcare Cost and Utilization Project (HCUP) 2013 State Inpatient Databases (SID) and State Ambulatory Surgery and Services Databases (SASD). This report evaluates inpatient and outpatient procedure data from 13 States that contributed to the 2013 SID and 2013 SASD: Connecticut, Indiana, Kansas, Maryland, Minnesota, Nebraska, New Jersey, New York, Ohio, South Carolina, Tennessee, Vermont, and Wisconsin. Historical data were drawn from the same 13 States in the 2005, 2007, 2009, and 2011 SID and SASD. Analysis was limited to hospitals within the 13 States that had cases in the inpatient and ambulatory surgery settings in each data year and for which bilateral versus unilateral mastectomies could be identified. In particular, States were included only if they provided complete outpatient procedure coding that would allow the identification of bilateral versus unilateral mastectomies, by International Classification of Diseases, Ninth Revision, Clinical Modification (ICD-9-CM) procedure codes, by Current Procedural Terminology (CPT®) procedure codes that included CPT modifiers, or by both. All-listed procedures include all procedures performed during the hospital inpatient stay or outpatient visit, whether for definitive treatment or for diagnostic or exploratory purposes. The first-listed procedure is the procedure that is listed first on the discharge record. Inpatient data define this as the "principal procedure" — the procedure that is performed for definitive treatment rather than for diagnostic or exploratory purposes (i.e., the procedure that was necessary to take care of a complication). Hospital discharge and ambulatory surgery visit records with mastectomy procedures were defined based on all-listed procedure codes as identified using the ICD-9-CM and CPT procedure codes in Table 3. Presence of breast cancer was defined using the ICD-9-CM diagnosis codes in Table 4. If codes for both cancer in situ and cancer not in situ were indicated on the same record, the record was categorized as cancer not in situ. Two additional ICD-9-CM V codes were considered for this Statistical Brief: V5041 (prophylactic breast removal) and V8401 (genetic susceptibility to malignant neoplasm of breast). The proportion of mastectomies without a cancer diagnosis that included one or both of these V codes increased substantially between 2005 and 2013, for bilateral and unilateral mastectomies as well as inpatient and outpatient mastectomies. We did not include the V codes as part of our primary analysis because it is unclear whether this increase represented an actual shift in the characteristics of patients who underwent a mastectomy or a medical practice change to more complete reporting of the nature of mastectomy procedures. This analysis used State Inpatient Databases (SID) limited to data from community hospitals, which are defined as short-term, non-Federal, general, and other hospitals, excluding hospital units of other institutions (e.g., prisons). Community hospitals include obstetrics and gynecology, otolaryngology, orthopedic, cancer, pediatric, public, and academic medical hospitals. Excluded for this analysis are long-term care facilities such as rehabilitation, psychiatric, and alcoholism and chemical dependency hospitals. However, if a patient received long-term care, rehabilitation, or treatment for psychiatric or chemical dependency conditions in a community hospital, the discharge record for that stay was included in the analysis. The analysis was limited to hospitals that had at least one mastectomy procedure performed in both the SID and the SASD in each data year. This analysis used State Ambulatory Surgery and Services Databases (SASD) limited to data from hospital-owned ambulatory surgery facilities. Although some SASD include data from facilities not owned by a hospital, those facilities were excluded from this analysis. The designation of a facility as hospital-owned is specific to its financial relationship with a hospital that provides inpatient care and is not related to its physical location. Ambulatory surgery performed in hospital-owned facilities may be performed within the hospital, in a facility attached to the hospital, or in a facility physically separated from the hospital. The analysis was further limited to ambulatory surgeries performed at facilities owned by community hospitals. Community hospitals are defined as short-term, non-Federal, general, and other specialty hospitals, excluding hospital units of other institutions (e.g., prisons). The analysis was limited to hospitals that had at least one mastectomy procedure performed in both the SID and the SASD in each data year. Charges represent what the hospital billed for the discharge. Hospital charges reflect the amount the hospital charged for the entire hospital stay and do not include professional (physician) fees. We report hospital charges rather than costs because Cost-to-Charge Ratios are not available for ambulatory surgery data. For the purposes of this Statistical Brief, charges are rounded to the nearest hundred dollars. Data on Hispanic ethnicity are collected differently among the States and also can differ from the Census methodology of collecting information on race (White, Black, Asian/Pacific Islander, American Indian/Alaska Native, Other (including mixed race)) separately from ethnicity (Hispanic, non-Hispanic). State data organizations often collect Hispanic ethnicity as one of several categories that include race. Therefore, for multistate analyses, HCUP creates the combined categorization of race and ethnicity for data from States that report ethnicity separately. When a State data organization collects Hispanic ethnicity separately from race, HCUP uses Hispanic ethnicity to override any other race category to create a Hispanic category for the uniformly coded race/ethnicity data element, while also retaining the original race and ethnicity data. All of the States included in the analyses for this Statistical Brief report Hispanic ethnicity. This Statistical Brief reports race/ethnicity for the following categories: Hispanic, non-Hispanic White, non-Hispanic Black, non-Hispanic Other (includes Asian/Pacific Islander, American Indian/Alaska Native, and Other). Steiner CA (AHRQ), Weiss AJ (Truven Health Analytics), Barrett ML (M.L. Barrett, Inc.), Fingar KR (Truven Health Analytics), Davis PH (AHRQ). Trends in Bilateral and Unilateral Mastectomies in Hospital Inpatient and Ambulatory Settings, 2005-2013. HCUP Statistical Brief #201. February 2016. Agency for Healthcare Research and Quality, Rockville, MD. http://www.hcup-us.ahrq.gov/reports/statbriefs/sb201-Mastectomies-Inpatient-Outpatient.pdf. *This Statistical Brief was revised to include 5 CPT mastectomy procedure codes that were valid in 2005. This affected the mastectomy counts that were contributed by 3 of the 13 States included in this Brief, resulting in an overall increase in the rates reported in 2005. 1 Polednak AP. Bilateral synchronous breast cancer: a population-based study of characteristics, method of detection, and survival. Surgery. 2003;133:383-9. 2 Yi M, Meric-Bernstam F, Middleton LP, Arun BK, Bedrosian I, Babiera GV, et al. Predictors of contralateral breast cancer in patients with unilateral breast cancer undergoing contralateral prophylactic mastectomy. Cancer. 2009 Mar 1;115(5):962-71. 3 Kurian AW, Lichtensztajn DY, Keegan THM, Nelson DO, Clarke CA, Gomez SL. Use of and mortality after bilateral mastectomy compared with other surgical treatments for breast cancer in California, 1998-2011. JAMA. 2014;312(9):902-14. 4 Kummerow KL, Du L, Penson DF, Shyr Y, Hooks MA. Nationwide trends in mastectomy for early-stage breast cancer. JAMA Surg. 2015 Jan;150(1):9-16. 7 National Cancer Institute. SEER Stat Fact Sheets: Breast Cancer. http://seer.cancer.gov/statfacts/html/breast.html. Accessed July 14, 2015. 8 Case C, Johantgen M, Steiner C. Outpatient mastectomy: clinical, payer, and geographic influences. Health Serv Res. 2001 Oct;36(5):869-84. 9 Russo CA, VanLandeghem K, Davis PH, Elixhauser A. Hospital and Ambulatory Surgery Care for Women's Cancers. HCUP Highlight #2. AHRQ Pub. No. 06-0038. Rockville, MD: Department of Health and Human Services, Agency for Healthcare Research and Quality. September 2006. http://archive.ahrq.gov/data/hcup/highlight2/high2.htm#Outpatient. Accessed July 15, 2015. 10 Wier LM, Steiner CA, Owens PL. Surgeries in Hospital-Owned Outpatient Facilities, 2012. HCUP Statistical Brief #188. February 2015. Agency for Healthcare Research and Quality, Rockville, MD. http://www.hcup-us.ahrq.gov/reports/statbriefs/sb188-Surgeries-Hospital-Outpatient-Facilities-2012.pdf. Accessed July 30, 2015. 11 Barrett M, Lopez-Gonzalez L, Coffey R, Levit K. Population Denominator Data for Use with the HCUP Databases (Updated with 2013 Population Data). HCUP Methods Series Report #2014-02. August 18, 2014. U.S. Agency for Healthcare Research and Quality. http://www.hcup-us.ahrq.gov/reports/methods/2014-02.pdf. Accessed January 7, 2015. Internet Citation: Statistical Brief #201. Healthcare Cost and Utilization Project (HCUP). March 2016. Agency for Healthcare Research and Quality, Rockville, MD. www.hcup-us.ahrq.gov/reports/statbriefs/sb201-Mastectomies-Inpatient-Outpatient.jsp.